After a biopsy or surgery, doctors often get a molecular snapshot of a patient's tumor. This snapshot is important – knowing the genetics that cause a cancer can help match a patient with a genetically-targeted treatment. But recent work increasingly shows that tumors are not static – the populations of cells that make up a tumor evolve over time in response to treatment, often in ways that lead to treatment immunity. Instead of being defined by a snapshot, tumors are more like a movie. This means that a tumor that recurs after treatment may be much different than the tumor originally seen in a biopsy. "People talk about molecular evolution of cancer and we were able to show it in this patient. With these three samples, we could see across time how the tumor developed resistance to treatment," says Daniel Bowles, MD, clinical and translational investigator at the University of Colorado Cancer Center and Head of Cancer Research at the Denver Veterans Administration Medical Center. The major change had to do with the proportion of the tumor made up of cancer stem cells, often seen as the most capable of driving growth of the disease: A sample taken during the patient's first surgery contained 0.2 percent cancer stem cells; a sample taken during the patient's third surgery contained 4.5 percent cancer stem cells. Additionally, the later tumor had overall 50 percent more cancer-driving mutations, and lower activity of genes meant to suppress cancer. 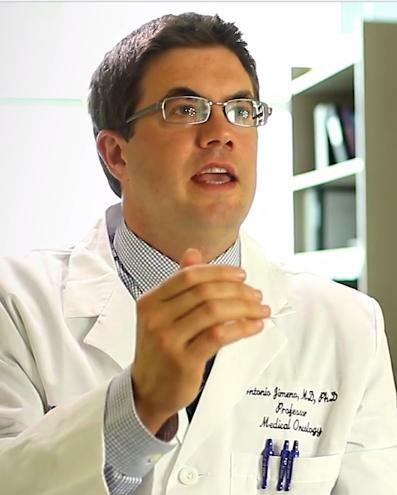 "By the third surgery, the tumor was invasive and aggressive," says Stephen Keysar, PhD, research assistant professor and basic investigator in the lab of senior author Antonio Jimeno, MD, PhD. Not only did the cellular makeup of the tumor change, increasing in the percentage of cancer stem cells, but, "all things being equal, if you compare a stem cell from the first surgery to stem cells from the third, the cells themselves became more aggressive," says Keysar. Bowles compares cancer treatment to attacking a weed: "Maybe what's happening is the therapies are exfoliating the plant but not affecting the root," he says. In this conceptualization, cancer therapies may kill the bulk of the cells that make up a tumor, but unless they affect the cancer stem cells – the "root" – the tumor may return. "When you treat a tumor and it's gone for a couple years and then comes back, it's likely that a population of cancer stem cells survived treatment. These stem cells can then restart the cancer much later," Keysar says. "Importantly, as these models are based on human tumors, they can be used in the future to explore at the cellular and molecular level how specific genetic alterations regulate cancer development and resistance to therapy," says collaborator Mary Reyland, PhD, professor in the CU School of Medicine Department of Pathology. "In this relatively simple but groundbreaking research work, we integrated molecular and cancer stem cell biology to show that tumors adapt and 'tool-up' to overcome therapies, leading to relapse in our patients. By pairing two young researchers with complementary expertise, and developing complex animal models, were we able to demonstrate the evolution of salivary cancers and the tumorigenic cells that drive them," Jimeno says. "Cancers don't ever come back better. At least I've never seen it," Bowles says. "And now we know one important reason why."